Good morning from My Road! And yes, it is my road. That’s the name the previous owner gave our long driveway, at any rate, and the county sanctioned it with a private road sign. My Road. And yes, it’s been stolen a couple of times. You may have noticed I’ve been MIA and mostly it’s been because of family health issues and needing to focus on that. But it’s also been because I’ve been digesting my successes and failures over the last 5 years. I’m not as scared of failure as I once was, but it still takes me some time to acknowledge when I’ve not done so well and even longer to figure out how to take that lesson and use it to my advantage going forward. Which is why I’ve been away for so long: deciding what to focus on and what to do next. And I’ve come up with some interesting ideas on the matter. So first off, I’ve decided to consolidate all my blogging and interests onto my website, instead of having everything spread around. It’ll be easier to keep up with and you’ll get a better picture of who I am and what I have to offer, why I blog, and all that jazz. You know I’m an author, but did you also know I’m a reformed fitness professional, healthy eating nerd, and an essential oil user? Or that I’m a registered Yoga Teacher with Yoga Alliance, an Emotions Mentor, and that I read the Tarot? Did you know I hike the Appalachian Trail with my hubs? And that I believe the Universe conspires to help adventurers? Well, I am, I do, I did, and I do. And now for the promised banana bread recipe. One of the things I’m really in to is creative cooking and baking. Someitmes, I make super healthy, super good for you stuff, and sometimes I make just really yummy fun food. Everythign in moderation, including moderation. 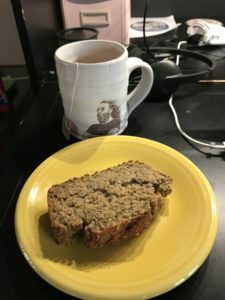 Soooo…I experimented in the kitchen with a new, Trim Healthy Mama friendly banana bread recipe. It turned out exceptionally well and I wanted to share. We discovered an oozie banana in the fruit bowl last night and I decided that the remaining three bananas needed to be made into banana bread asap. But, as some of you may know, I have been avoiding sugar the last few months and didn’t want to load this one up with the sweet stuff. Thus, I turned to the Trim Healthy Mama groupies on Pinterest. I found a lot of recipes, but none of them were exactly what I had in mind or I was missing too many ingredients or I knew from past experiences I wouldn’t like the outcome. For example, if I see a recipe with lots of egg whites and very little flour, I know I”m going to get something very eggy and soufle-like. Not my thing. So I decided to take a stab at creating my own recipe. My family is almost fully converted and accustomed to my sugar alternatives: honey, coconut palm sugar, Stevia, xylitol, and erythritol. Almost. They’re fine with the first two, but have things to say about the last three. I don’t blame them. It takes awhile to adjust the taste buds, and sometimes Stevia tastes bitter if you’re not careful about which brand you buy and how much you use. I learned from the Trim Healthy Mamas that when it comes to Stevia, a little “doonk” will do you. Many of the recipes I came across used all oat flour, but I wanted to incorporate some coconut flour for the fiber content. Did you know oat flour has 2.5 g of fiber per 1/3 cup while coconut flour has 7 g per 2 tablespoons? That’s pretty impressive. I use a diy version of the Trim Healthy Mama’s Gentle Sweet. The recipe can be found at Taryn’s Joy Filled Eats blog HERE. If you’d rather use white table sugar, go for it, but you’ll need to adjust the amount. HERE is a handy dandy conversion chart. Okay, so keep in mind I use a Ninja blender/food processor set–the one with the motor that sits on top–to mix up the ingredients. Why? It’s super easy and fast, and with my Ninja blender the clean up is stupid simple. And I need stupid simple when it comes to cleaning up. If you have no idea who this Trim Healthy Mama is, go check out their website HERE. And for those of you who are already familiar, this recipe is an E or Energizing. I know the Mamas warn about bananas spiking your blood sugar, but I think the fiber is high enough and if you’re wise about your portion size, you should be fine. If you don’t have oat flour on hand, grind up some rolled oats. Same thing, basically. And if you want this recipe to be 100% gluten free, make sure your oats are designated gluten-free. Even if they’re not, the gluten in oats is not all that much. Preheat the oven to 350 degrees. Break up the peeled bananas into the blender. Add the apple chunks, egg whites, yogurt, and vanilla extra. Blend just long enough to mix ingredients. Don’t worry if the apples are chunky at this point. By the time you’re done mixing everything they should be fine. Add the dry ingredients and blend just long enough to incorporate all ingredients. You may need to scrape the sides of the blender a couple times. Grease the bread pan or line with parchment paper before pouring the batter into the band. Bake for 50-60 minutes until golden brown. Transfer from pan to cooling rack. 1/6 of a loaf is one serving. I’m having a slice right now with my tea as I type this up. Sooooo good. That’s about all for now, my friends. The Little Flame Gets a Makeover Giveaway! Here's a link to my previous blog posts.